After reading The Penny Hoarder, I know that crazy money-making ideas work. And with more than $30,000 in student loans, I knew I needed to try something unusual. After a conversation with a friend, I went for it — and now I have a side gig that pays more than $1,000 a month and helped me pay off my student loans three years ahead of schedule. A friend of mine is a horse enthusiast who’s active in the horse show scene. One day she mentioned she couldn’t meet up for drinks because she needed to save money to pay her braider the next day. Confused by what that meant, I asked her to tell me more. It turns out she pays a woman $100 to braid her horse’s mane and tail before every show. I had zero experience grooming animals, but I could do a mean French braid on my own hair — how much harder could it be on a horse? I watched a few YouTube videos on how it’s done and what supplies I would need, and I ordered a cheap $20 kit off the Internet. The kit comes with a leather belt/holster, a comb, brush, tiny scissors, thread ribber, and clips to hold hair back. My friend let me practice on her horse a few times to make sure I could actually do it. While practicing, I found out why people can charge so much for braiding: It’s not particularly hard, it’s just time-consuming. With a few tries, I was able to master the tail braid and special braids and nubs needed for the horses’ manes. Once I was reliably getting decent results, I decided to take my skills on the road to see if I could make some money on the side. I looked up upcoming shows on the Internet, and decided to aim for mid-level ones. 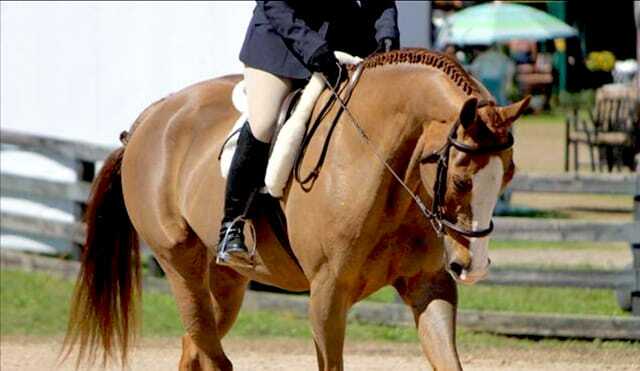 Small schooling shows held at local barns are usually very casual and the horses are rarely braided. Top shows have extremely experienced braiders I wouldn’t be able to compete against. But mid-level shows have many people looking to move up in the horse world who would love an added edge with their horses’ appearance. Once I found a few mid-level options, I called the show locations ahead of time to make sure it was OK if I sold services. No one had any problem with it… in fact, they all said there was huge demand for braiders at their shows. I showed up at my first show with my cheap braiding kit: small rubber bands ($4 for a 500-pack), a needle and thread ($2), and dollar store hair gel ($1). Within a few minutes, a young girl and her parents approached me and asked if I’d braid her pony. I told them it would be $20 for the tail and $30 for the mane. They didn’t hesitate at my price, and within 45 minutes I had braided her pony passably well. The family was pleased and even tipped me on top of my $50 fee. Before they walked away, two more people approached me to braid their horses. As the day progressed, I couldn’t keep up and my hands got sore. I ended up upping my rates in hopes of cutting down on demand, but it didn’t work. I worked for six hours straight and made over $500 before I just couldn’t braid anymore. I thought it was just a fluke, but I went to several more shows and had the same experience. I started learning different braiding techniques that are specific to certain breeds to offer even more options for customers, and I started charging $100 to $150 a horse. It’s not all fun and games, though. Besides aching hands, I do have to deal with manure (so much manure) and the occasional horse who thinks braiding is torture. I had to start telling owners their horses had to be able to stand quietly or I would not braid them for my own safety. But for the most part, the horses were used to this process and would rest while I worked. I’ve been braiding horses on the side for over a year and regularly average $1,000 a month in profits — after deducting the cost of supplies and gas — working just on Saturdays or Sundays. The spring and summer months are the most popular, since that’s when the show season is most intense. But there are plenty of fall and small winter shows to keep me busy. I’ve since started treating this more seriously; I now have professional signage and business cards, and I have a list of regular clients. Many of them call me to braid their horses at their own homes before the show and are willing to pay me a premium for that service. To keep my earnings as high as possible without wasting multiple days, I try to stay within an hour’s drive of my home. I’m very selective about which shows I attend; I only look for shows that have more than 100 competitors, so I have a good chance of getting steady business. Two or three times a year, I will travel to big regional shows. These are more of an expense since they last for several days and I need a hotel room, but they’re worth it because competitors are willing to pay top prices. I can easily make $1,000 a day at these shows. When I started braiding, I had been making just the minimum payments on my $30,000 in student loans for about four years. After my braiding business started doing well, I started putting an additional $500 to $750 toward the principal every month. Just 18 months after I started using braiding money for extra payments, I finished paying off my loans — a full three years ahead of schedule. While not everyone dreams of being a horse braider, this just shows there are plenty of crazy ways to make serious money on the side. Any skill you have, no matter how simple you may think it is, can be a lucrative asset someone else needs. My nimble fingers turned out to be the path to paying off my student loans ahead of schedule. Your own talents can be the pathway to extra money.